The World Economic Forum’s Global Gender Gap Report 2017 estimated that it will take another 217 years to close the economic gender gap. At EY, we aspire to play a differentiating role in addressing this global challenge. Endorsing gender parity in leadership is a smart way to build an inclusive and successful organization. However, the current representation of women in leadership reveals the disconnect between organizations’ current strategies and women’s inclusion at workplace. While research in 2015 done by The Peterson Institute for International Economics and EY revealed that an organization with 30% female leaders could add up to 6% to its net margin, the progress to attaining gender diverse leadership continues to fall short of public hopes and expectations. Over the last few years, several countries have adopted diverse approaches to addressing the issue of women representation in leadership, including voluntary measures and mandatory quotas, the latter being enforced mainly in Europe. In India, the revised Companies Act approved in August 2013 made it mandatory for all listed companies and other large public limited firms to appoint at least one woman director to their boards. Corporates have also made efforts to boost their gender diversity agenda by implementing initiatives such asgender sensitive recruitment practices, exible workarrangements, sponsorship programs, mentorship networks as well as establishing a culture of accountability at the top. However, there is still more ground to cover to increase gender diversity in leadership. The speed of instituting these initiatives varies across the globe but the direction is certainly set towards creating an inclusive ecosystem. Bringing diverse perspectives and innovation to thetable while enhancing an organization’s profitability at the same time makes the business case for increased women representation in leadership more compelling and widely accepted. 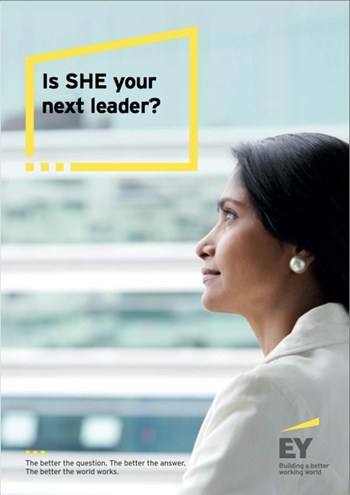 In light of this backdrop, EY serves as a Knowledge Partner at the Asian Women in Leadership Summit and brings forth a report titled, “Is SHE your next leader?” that contributes to building a better working world for everyone. The report can serve as a catalyst for both governments and businesses to accelerate their gender parity efforts through effective policy making and prioritizing gender parity as a crucial economic and ethical imperative. We hope this report will leave you inspired to make a real difference towards achieving gender parity.